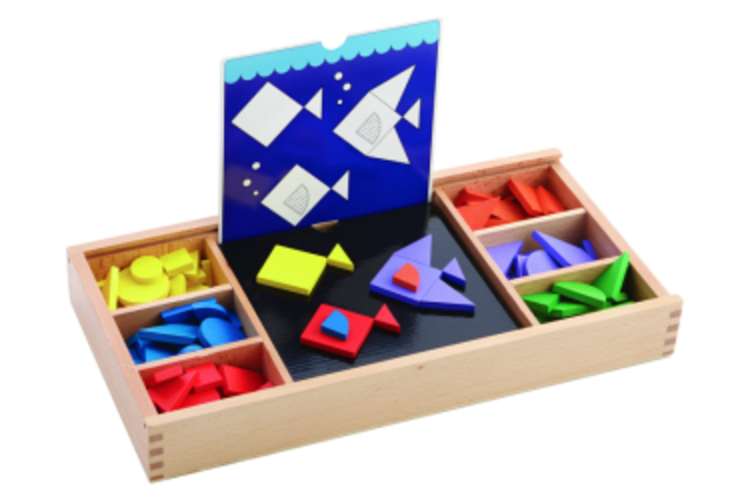 Perfect for your toddler to learn sorting & colors! A counting, matching and sorting game that holds their attention because little ones love little things. They love to hold these acorns and it’s great for learning colors, early math and counting skills, as well as developing fine motor skills. 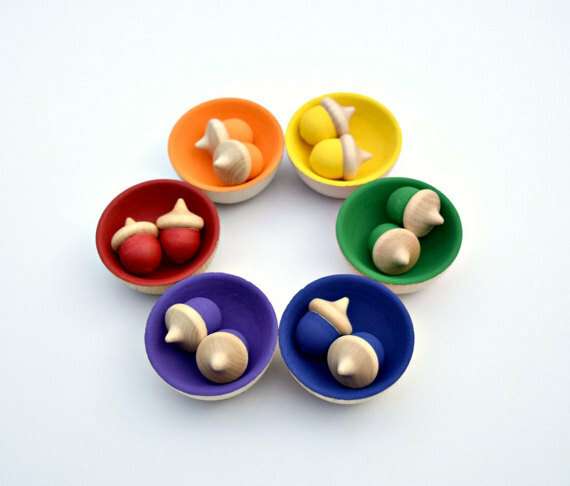 Each set comes with 12 acorns and 6 bowls painted in bright rainbow colors. They only use certified, non-toxic, soy based paint but this toy requires supervision. Best for toddlers who’ve stopped putting everything in their mouths. The acorns measure 1 3/8″ tall, and the sorting bowls are 2.5″ in diameter. Get it on Etsy for $26. 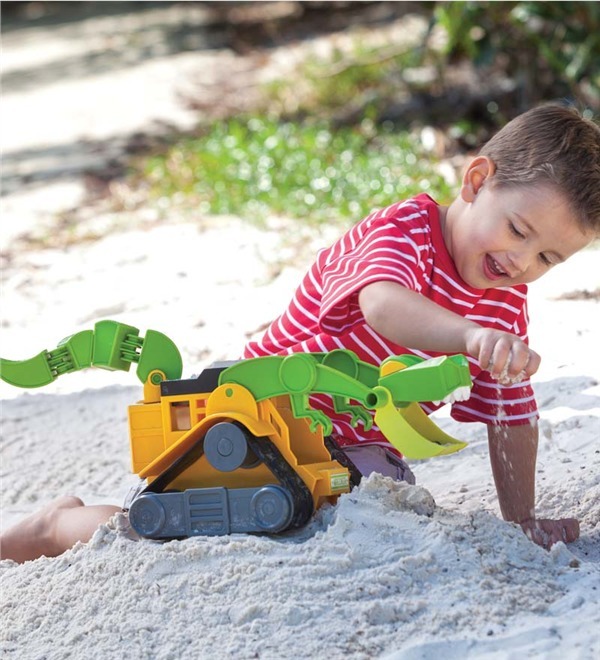 Perfect for your little builder! 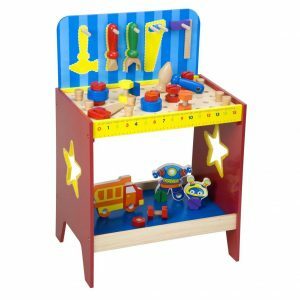 This wooden toolkit includes everything your little builder needs in order to explore his or her inner carpenter! Tools are all crafted completely out of high quality wood. They come in wooden case for organized storage. 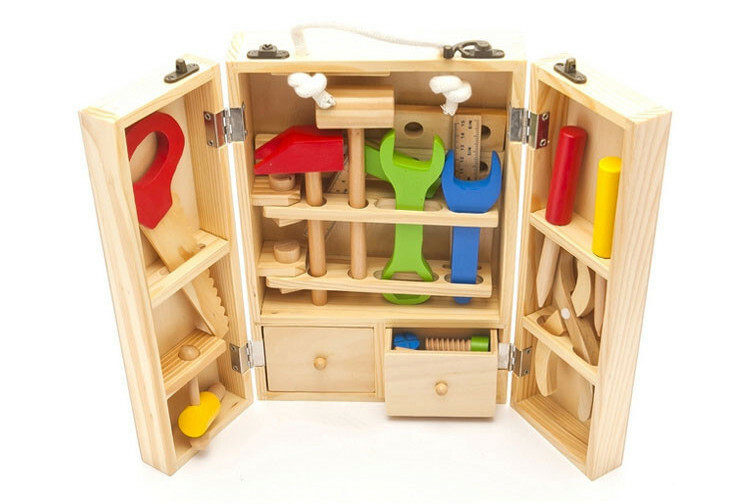 Your toddler will love to play pretend with these well made tools! This item is $31 on Ali Express and ships from overseas so be sure to order at least a month in advance so you’ll get it on time! For your toddler to learn letter sounds! These adorably illustrated boards are a great way to lay the foundation for word recognition. 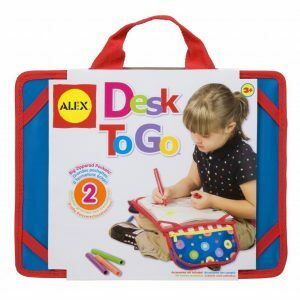 The child simply picks a board–the first letter of his or her name is always a good place to start–then fills in the uppercase and lowercase letters and identifies the picture. He or she can turn it over or take another board and do it all again. With so many letters (each letter in the alphabet in both uppercase and lowercase), children can find infinite ways to play! This toy will have a long lifespan, create interest when they’re little and be useful up until they start reading! Available for $19 on Melissa and Doug. 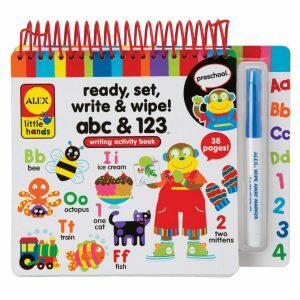 Perfect for your toddler learning letters and numbers! 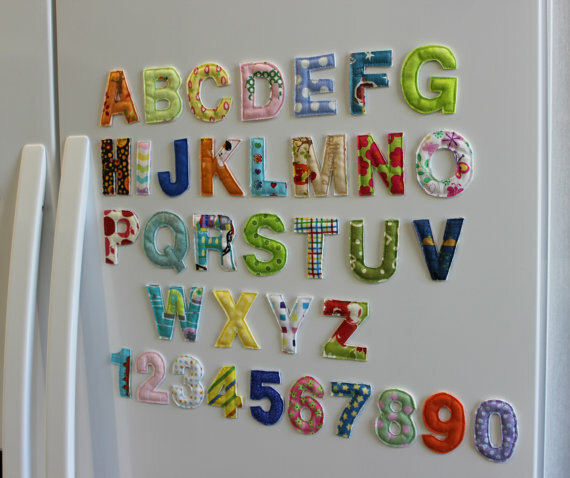 These adorable little fabric letters and numbers are perfect for your refrigerator or a magnetic board. They are made from fabric and each set is unique. Inside each letter is a soft batting and small magnet. There are no sharp edges or chance of a loose magnet. 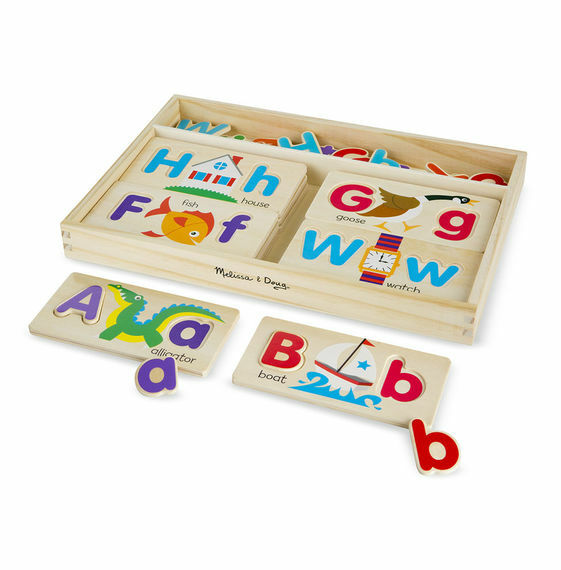 These are just the cutest little letters and can used to teach your child to count and spell. If handmade and one of a kind are priorities for you this is the right gift! So precious and personal! Available for $53 on Etsy. Nurture your budding musician! A complete rhythm instrument set in one bag gives your child everything he or she needs to lead the band. 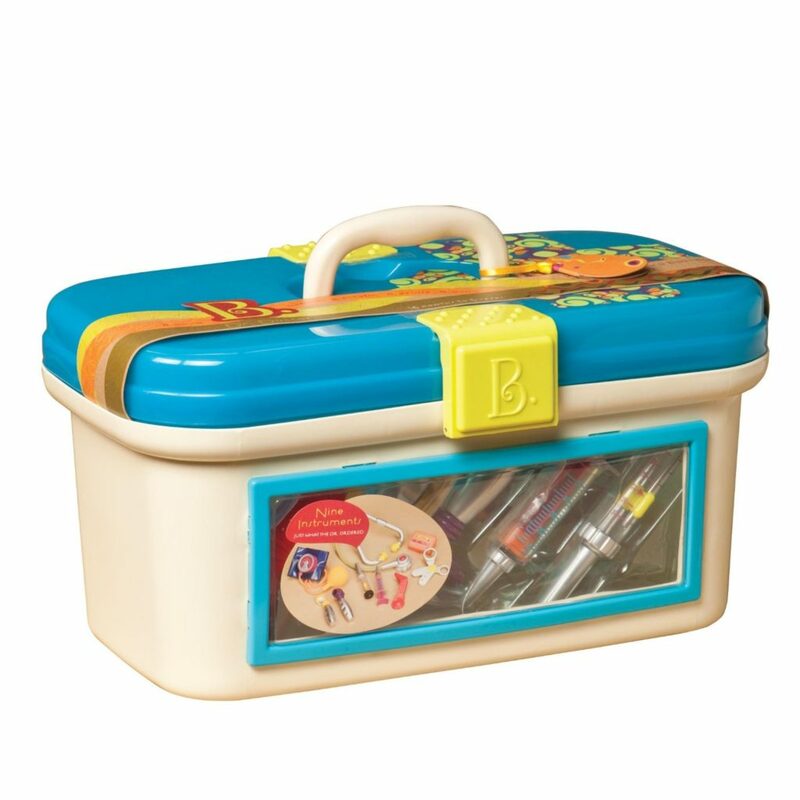 The kit comes with a zippered carrying case for easy cleanup and storage. Various instruments including maracas, tambourine, egg shakers and triangle provide a wide range of sounds. Safe and reliable for young children ages 3 and up. High quality construction that’s built to last for long time play and fun. 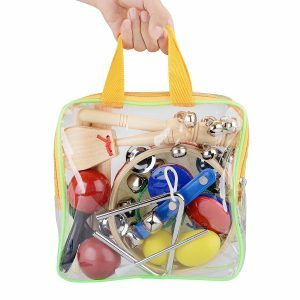 Perfect size instruments for preschool and early elementary children in group or individual play. Available for $29 on Amazon. 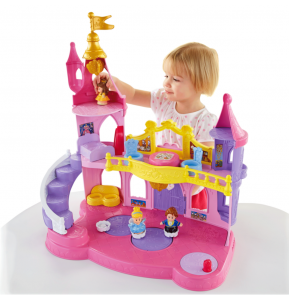 Surprise your princess loving toddler! Recreate magical moments on the dance floor with Disney Princess characters Belle and Cinderella. Spin the lever to watch them spin and twirl. The “magic” happens with music, sounds and phrases like “Isn’t this music beautiful?” and your little princess will bring the pretend play to life! Look for it on Fisher-Price for $40. Introduce your toddler to tech! The InnoTab 3S Plus lets you learn, create and connect using a kid-safe Wi-Fi connection to the Internet. 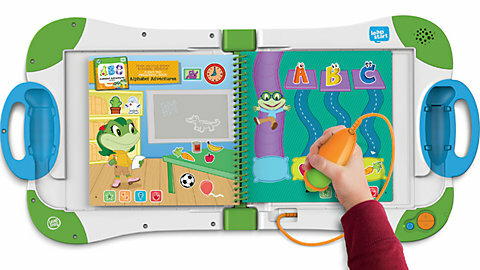 Now your child can search VTech and parent-approved websites as well as communicate in real time with Premium VTech Kid Connect™ on their very own kids’ tablet. Exchange text and voice messages, photos, drawings and fun stickers with smartphones using our exclusive app available on the App Store℠ and Google Play™. In addition to the Rechargeable Power Pack and 16 included apps, your child will have access to more than 650 additional cartridges, software and apps you can download from VTech’s Learning Lodge™. 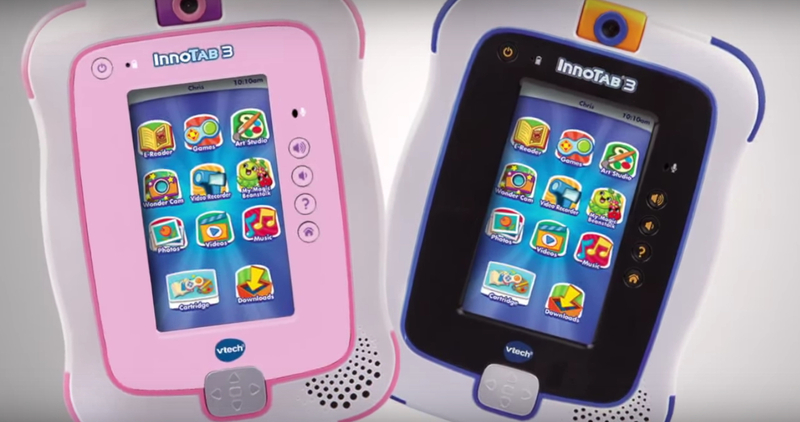 Pick one up for $79 at Vtech Kids. For the little singer/songwriter in your house! 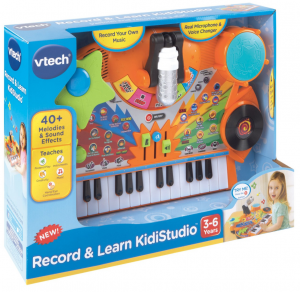 Now your toddler can perform and record like a rock star with the Record & Learn KidiStudio™ by VTech®. Be creative and explore a variety of musical instruments. Adjust the tempo and sing along to the music while recording a musical masterpiece to share with family and friends. Learn to play favorite melodies by following the lights on the light-up keyboard. You can also choose an instrument and use the keyboard to play that instrument’s different sounds. Your toddler will love to dance and have a jam session to this toy! 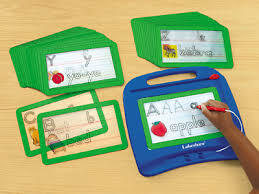 Cost is $53 and you can learn more at Vtech Kids. Perfect for the truck loving toddler! Ever wonder what it feels like to operate a real Cat® machine? Find out with the Caterpillar line of construction toys. You’ll experience “The Feel of Real” every time you play! 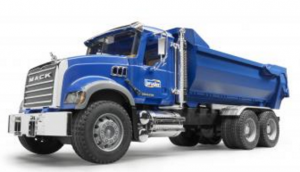 This CAT 18″ Rev Dump Truck can handle even the most difficult jobs. You can use it in dirt or mud, nothing can stop this awesome CAT Truck. 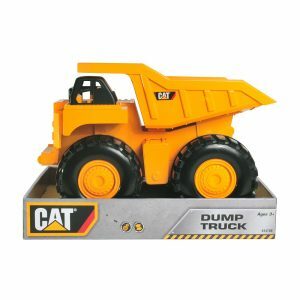 Shop this for $55 and more construction toys at Shop Caterpillar. Lets your car-loving toddler FIX IT! 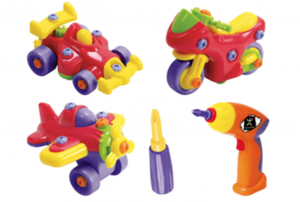 This junior-mechanic set has a working power tool and a shop full of parts to build three free-wheeling vehicles! A motorcycle, prop plane, and race car are sized right for small hands and feature moving parts. Includes tool box, dull child-safe electric power drill and manual screwdriver, and extra screws. 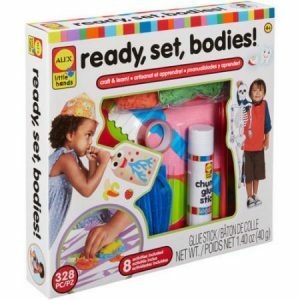 A great option for little tinkers and sells for $40 at Discovery Toys. Storage that teaches toddlers to spell their name! 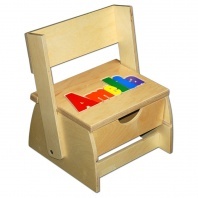 This wooden step stool displays your child’s name in a colorful wooden puzzle and comes with a flip step and spacious storage drawer for all a young person’s treasures. 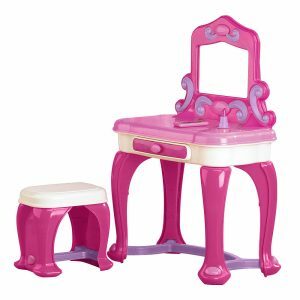 Stands 15 inches tall with step up and 8 inches tall with the step in the down position. 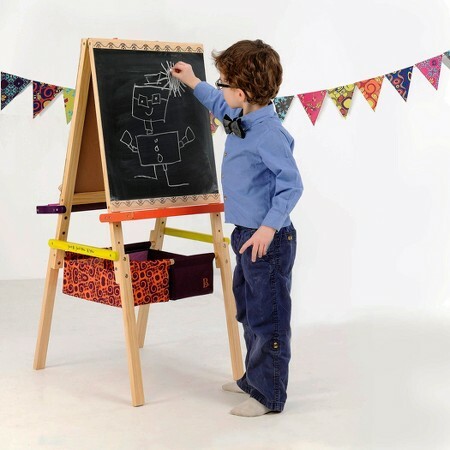 Dimensions of the stool top are: 9 inches wide and 12 inches long. Constructed with our incredibly durable ¾ inch and 1/2 inch Baltic Birch to last a lifetime. All Step n’ Store Name Puzzle Stool finishes are water based and non-toxic. It’s a gift that will be treasured and saved. The cost is $125 and it’s available at Damhorst Toys. Perfect for the toddler who enjoys baking! 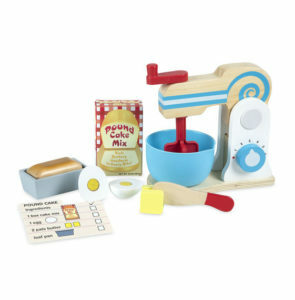 Mix up some delicious pretend-play fun with this realistic wooden mixer. Turn dials to “adjust speed” and use the crank to turn the bowl that fits the mixer. Wooden ingredients include two pats of butter and a two-part egg, both of which have self stick tabs that can be sliced through with the child-friendly wooden knife. Follow the directions on the recipe card to make pound cake – the set includes a pound cake mix box, pretend pound cake loaf, and a cake pan. 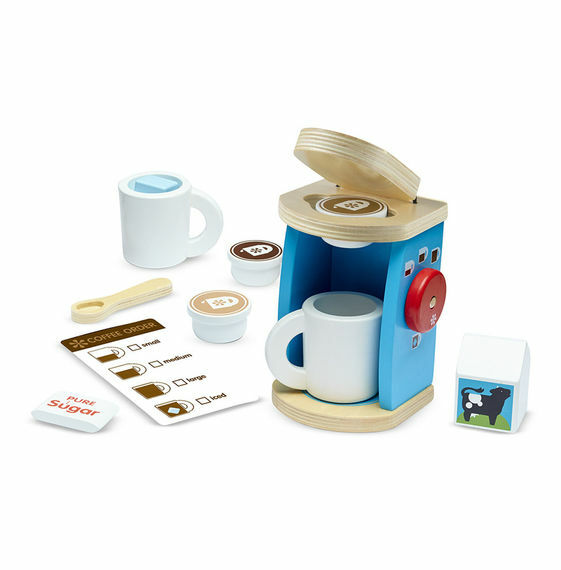 Kids three and older will love cracking, slicing, blending, and serving up pretend baked treats with this set that encourages creative thinking and imaginative play and promotes memory and number skills. It retails for $24 on Melissa and Doug. 27) Little Hands Ready, Set, Bodies! Helps toddlers see what their bodies can do! 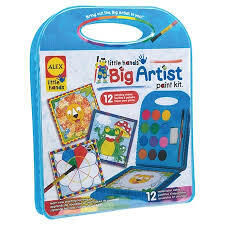 Give the gift of 8 arts and crafts projects that teach your little one what’s going on inside of them. Make a body collage, a heartbeat drum, a paper bag lung, connect the bones of a skeleton with pipe cleaners, a brain cap that shows what’s on your mind, a nutrition chart, a giant mouth to brush and learn to read without using your eyes! Recommended for children 4 years of age and older. 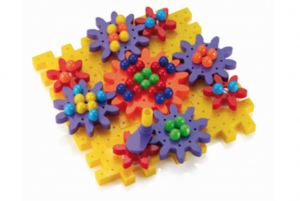 This activity kit will keep them busy! Find it for $26 on Alex Brands. This list was created by Cristy, a teacher herself and mom of boy/girl twins, age 2. These gift recommendations are not sponsored. Each toy made the list because our kids love it! Many of these toys we already had and in some cases we received samples to check the quality. All opinions are our own, from Cristy and our circle of “Deal”icious moms!! I’ve never seen some of these and I’ve had 3 children! Thanks for sharing. I’m leaning toward the Fabric letters on Etsy but ouch it’s pricey.